There’s nothing quite like the deep throb of an American train whistle, the ‘all aboard’ from the porters and guards and the sense of excitement as you contemplate the coming days and nights on the railroad. 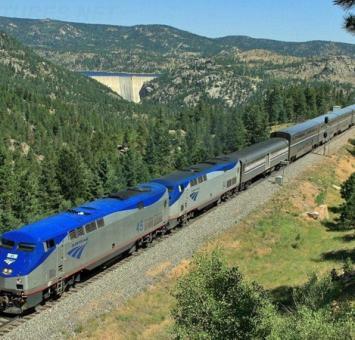 And, one of the most exciting train trips is the famous California Zephyr. Following the wagon tracks of the great pioneers, the Zephyr is the flagship of Amtrak's fleet, a super liner with an all-window panoramic lounge car and a tick list of iconic Americana that includes the cornrows of Nebraska, the Rockies, the Sierra Nevada, Omaha, Denver, Salt Lake City and San Francisco, 56 hours and 2,438 miles - a classic journey. 3 nights in the 5 star Westin Hotel, San Francisco. Other durations/dates//hotels are available. Fancy carrying on your rail adventure and heading down the scenic California Coast to Santa Barbara, Los Angeles or San Diego? Call Bon Voyage to discuss the options available to you.